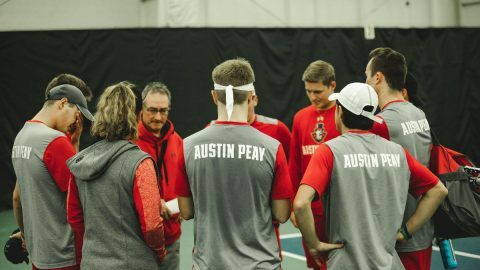 CLARKSVILLE,TN– Austin Peay State University men’s tennis team fought until the end, but came up just short of another win, falling to IUPUI, 4-3, Friday, at the Governors Tennis Center. The Governors (1-5) were competitive in doubles, but ultimately lost two close matches at No. 2 and No. 3 doubles. Almantas Ozelis and Anton Damberg were up 6-5 at No. 1 doubles, but the match went unfinished after the Jaguars (5-3) claimed the doubles point. Singles play started off competitively as well, with each team taking the first set in two matches. Unfortunately, after claiming the first sets at No. 2 and No. 4 singles, the Jaguars went on to win those matches in straight sets to go up 3-0 overall. Damberg easily defeated his opponent in straight sets, 6-0, 6-4, to put the Govs on the board, but Ozelis was forced into a third and final set. Meanwhile, play had started at No. 5 and No. 6 singles, with Hunter Sanders taking the first set at the No. 6 position. Despite a one-set lead for Sanders and Ozelis leading the third set early, the Jaguars got a clutch win at No. 5 singles and claimed the match, 4-1. Sanders and Ozelis did win their matches though, as both Sanders and Ozelis have won two matches in a row. Damberg has also won his last two singles matches, both in straight sets, while Sanders won a superset to eight games to go along with his straight-set win today and Ozelis has grinded out two three-set wins. The Govs have over a week off before their next match, hosting Carson-Newman next Saturday.